The study of literature can be a life-enhancing and civilising branch of academic enquiry that develops our appreciation of history, culture, philosophy and human behaviour. Analysing and responding to themes, characters and perspectives in texts requires students to define their own moral and ethical viewpoints. 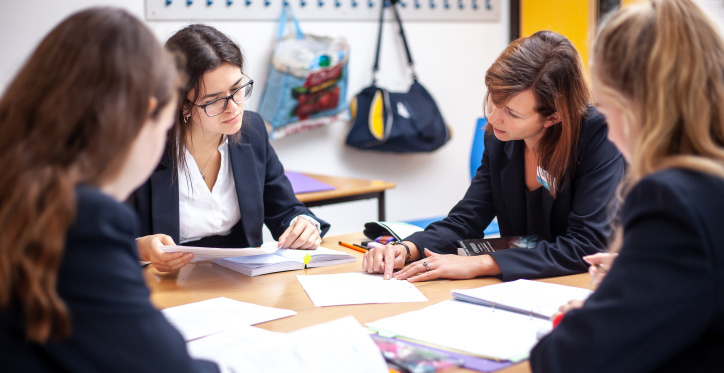 The principal aim of the A level course is to develop students’ interest in and enjoyment of literature so that they become confident, independent and reflective readers. The course encourages engagement with a wide range of literary texts which will challenge students and take them beyond the scope of their reading experience. Some of the texts are set texts prescribed by the exam board and others students will select for themselves. The course encourages students to engage critically and creatively with texts and ways of responding to them and to undertake independent and sustained studies to deepen their appreciation and understanding of English Literature, including its changing traditions. Students can expect to read a wide range of literary texts from across the canon of English Literature, from the Victorian novel and Shakespeare’s plays to a study of 21st century poetry. A level English Literature students are encouraged to think critically and objectively about the themes they encounter and the ways in which writers shape readers’ responses to them. Successful students are those who can write elegantly, articulating their understanding with sensitivity, sophistication, precision and accuracy. English Literature A level can complement almost anything. However, it sits naturally with other humanities subjects such as History, RS and modern foreign languages, but also with creative subjects such as Drama and Art. English Literature A level can also be a useful accompaniment to a more scientific A level profile indicating breadth and clarity of thought. English Literature students are highly prized by universities because they have excellent planning and research skills, can handle complex ideas, can find patterns and consider the wider contexts of information. Their ability to communicate this understanding effectively and efficiently is extremely valuable both at university and in the workplace. Every year, several girls go on to read English Literature at university and other related courses such as creative writing and journalism. Students consider the concerns and choices of contemporary poets in their study of an anthology of 21st century poetry: Poems of the Decade: An Anthology of the Forward Books of Poetry 2002-2011. They are required to compare an unseen poem with one from this anthology. The second poetry text will be from a specific literary period, such as the Metaphysical Poets, the Romantics or the Victorians. The coursework unit offers an opportunity to develop a student’s own literary enthusiasms. They choose two texts and prepare a comparative essay exploring links between them by theme, movement, author or period.